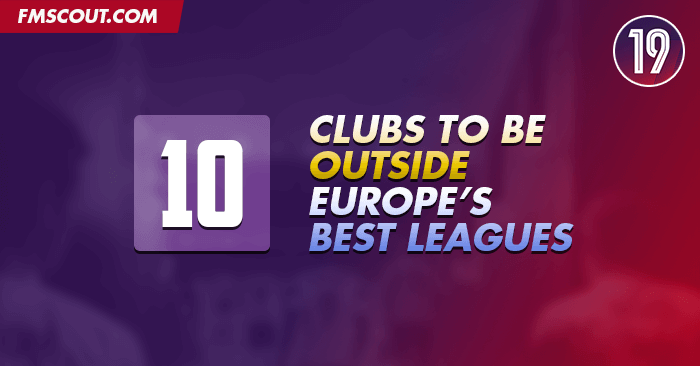 From Belarus to Mexico and Luxembourg to Japan, these are 10 clubs to manage and why you should manage these teams in FM19, outside of Europe's top leagues. Today I’m going to show you 10 teams outside of the big leagues that you should try. During this miraculous trip I’ll show you 10 teams, from different countries, and show you why you should take the job. The first stop of this journey is Brest, Belarus (not France). The Belarusian team isn’t world-famous because of some fascinating history or an amazing story. No. The Belarusian side never won it’s nations highest honour and only 3 cup wins and one Super Cup win fills the trophy cabinet in Regional Sport Complex Brestsky, the 10000+ seater stadium. The club got massive attention after no other then Diego Maradona became director of the Belarusians. The flamboyant Argentine has since joining them said to be filled with ambition for he club. The question is: Can you cope with the Argentine and his ambition? Or are you the first of many to fall? First of all you need to de-throne BATE Borisov, before you can even think about Europe. If I would’ve asked you 2 years ago about Vissel Kobe, you were wondering what I was talking about. However, after the signings of German veteran Podolski and Barcelona Icon Iniesta, Vissel Kobe announced themselves to the world. Off to Denmark we go next, for FC Midtjylland, apart from being worth a lot of points in a game of scrabble, Midtjylland is know for their ‘moneyball’-approach. An approach which got a lot of attention outside of Denmark, but no success as of yet outside of Midtjyllands native Denmark. The decision is up to you, will you continue with money-balling yourself tot he Champions League victory or will you drop the idea completely and take a different approach. Whatever you do, managing a talented FC Midtjylland side will always be fun. When you think of a home-grown challenge, you think of Atletico Bilbao with their Basque players, an unique way to play, but if we head over to Mexico we find Guadalajara. The club also values their home-grown players insanely and have the rule that your entire team must consist of Mexicans. Combine that with an unique league and some really decent potential players and you’ll have a fun save in which you’ll need to compete in a tricky league and an even trickier North American Champions League. The Mighty Magyars. Probably one of the most fascinating teams in the history of the beautiful game. During the 50’s the Hungarian side showed some of the finest football in the world, lead by, later Real Madrid super star Ferenc Puskas. Puskas enjoyed the start of his career at Budapest Hovest together with some of the other Magyars. So, can you find your own Mighty Magyars and return Hungarian football tot he heights it once was. Leon Bailey, Milinkovic-Savic, Kalidou Koulibaly, Kevin De Bruyne and Thibaut Courtois. 5 completely different players with different career paths, apart from one small detail: All enjoyed their break at Belgian side KRC Genk. The Belgians are one of the biggest clubs in a competitive Belgian league and it gives you a solid base to start. With great facilities and pretty good reputation, the Belgian side gives you a great foundation to add tot he few league titles you have. After finding the next De Bruyne or Courtois, you can go on and battle with some of the best of Europe. Sometimes some stats come completely surprised, the same happened when I found out Göteborg is a 2x EL winner. Almost 50 years ago the Swedish side enjoyed the best years of it’s history. Unfortunately, things have fallen down, Since 2007 IFK Göteborg didn’t win the league once and with teams like Malmo FF and Östersund competing, it’s the question if they will without your help. Can you return Göteborg tot he glory years and win some European silverware? The bronze medal will be for Dundelange, a club from Luxembourg. In the 18-19 season Dundelange became a fairy tale story qualifying fort he Europa League, an achievement bigger then the country of Luxembourg. A save that’s comparable to a save in San Marino or Gibraltar, Dundelange will be one fort he long-term, getting into Europe should be your goal for quite some time and when you get in, you have a long way to go. Can the fairy tale continue? Probably the least surprising pick in this list. Partizan (and Red Star) are easily some FM player favorites. Serbia is a fantastic place for regen and with some tough rules in the league, managing in it is even better. Both Partizan and Red Star will help you produce some fantastic players. The more challenging thing will be to keep those players and keep the big clubs away. Both Serbian teams will give you a blast and see you struggle as well, but the future is bright, whichever team you may be choosing. It has been a decade of ups and down. In 2010 the Enschede-based club won the Eredivisie fort he first time in it’s history, followed by a KNVB Beker win in 2011, as well as winning 2 Super Cups. However in the 17-18 season FC Twente was relegated from the highest tier and find themselves in the 2nd tier. Besides being a kind of fallen giant, FC Twente has been struggling with finances and find themselves deep in the red more often then not. Can you revive FC Twente from their death and help them climb up in Dutch football again. Rules in Serbian league are fantastic? Why ? Can you make precision? Handcrafted in Symi, Hellas. Page created in 0.138 seconds.